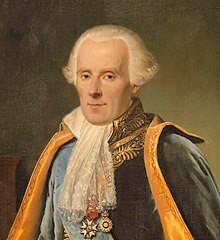 Pierre-Simon, marquis de Laplace (23 Mairch 1749 – 5 Mairch 1827) wis a French mathematician an astronomer whose wark wis pivotal tae the development o mathematical astronomy an statistics. He summarised an extendit the work o his predecessors in his five volume Mécanique Céleste (Celestial Mechanics) (1799–1825). This wark translated the geometric study o classical mechanics tae ane based on calculus, openin up a broader range of problems. In statistics, the sae-cried Bayesian interpretation of probability wis mainly developed bi Laplace. He formulated Laplace's equation, an pioneered the Laplace transform which appears in mony branches of mathematical physics, a field that he teuk a leadin role in forming. The Laplacian differential operator, widely uised in applied mathematics, is an aa named efter him. He restated an developed the nebular hypothesis of the origin of the solar system an wis ane o the first scientists tae postulate the existence of black holes an the notion of gravitational collapse. He is remembered as ane o the greatest scientists of aa time, whiles referred tae as a French Newton or Newton of France, wi a phenomenal naitural mathematical faculty superior tae ony of his contemporaries. He became a count o the First French Empire in 1806 an wis named a marquis in 1817, efter the Bourbon Restoration. Wikimedia Commons haes media relatit tae Pierre-Simon Laplace.